This suggests a more holisitic approach to integration that considers the provision of expanded public services alongside work to address concerns about identity and difference, with support for settlement programmes. School Segregation is the result of official policies, as much as parental decisions. The general election will, of course, be dominated by Brexit. But, in the light of the Casey review, it should also make some space to discuss issues of integration and segregation. The increasing segregation of our schools is one very good reason for that. A number of previous reviews of school segregation have refused to even recognise the problem as it seems to run counter to parental choice. Or, it has been dismissed on the basis that ‘nothing can be done – schools just represent the areas around them.’ These have been convenient excuses. School admissions can easily be adjusted – only in the last week or so the government has made it clear that grammar schools will be expected to include more children from poorer areas. Our new report, Understanding School Segregation in England 2011-2016, by iCoCo Foundation, SchoolDash and The Challenge separates the two issues of school admission policies and segregation and exposes the reality of how schools segregate young people from an early age. It also reveals a pattern of increasing school segregation and especially, that school segregation now exceeds the segregation in the local area, as measured by the proportions of school age children who could take up places. Schools now need to take responsibility – perhaps especially the governors – for the problems that they are helping to create. We should recognise that school segregation is the result of official policies, as much as that of parental decisions. The focus of segregation in the past has also been on the concentration of ethnic minorities, but this is only part of the story – the over representation of ethnic minority pupils (categorised as ‘low’ White British’) in some schools is almost inevitably supported by schools that have an over representation of White British pupils (categorised as ‘high’) in other schools and our approach thus enables us to highlight those schools that are ‘contributing to segregation’. These schools also need to be challenged and have been neglected by more traditional approaches to segregation. A large number of schools are included in this category and for many local authority areas the number of schools with an over-representation of White British pupils exceeds those with a low representation. This is also true for some categories of schools, perhaps especially faith schools. Catholic and Church of England schools are by far the most numerous and their collective impact on school representation is clearly significant yet often unexamined. As an example, in one London Borough the 17 faith primary schools that have somewhat diverse intakes, take up to five times the proportion of White British compared to the area, substantially reducing the potential for other schools to become more mixed. We now need to recognise that school segregation is not simply the result of ethnic minority clustering and cultural determinants – it is actually fostered by institutional arrangements and supported by traditional patterns which have been exacerbated by recent policy choices. Change is possible. We now need to put a premium on mixed schools and develop a strategy to achieve that aim. “This study shows far more needs to be done to make sure school intakes are representative of local communities. As the government’s Casey Review pointed out, segregation is at a “worrying level” in parts of the country. At a local and national level, Government needs to commit to doing much more to reduce school segregation. We know that when communities live separately, anxiety and prejudice flourish, whereas when people from different backgrounds mix, it leads to more trusting and cohesive communities and opens up opportunities for social mobility. “We urge local authorities, faith schools and academy chains to consider the impact admissions policies have upon neighbouring schools and put policies in place that encourage better school and community integration. From a wider perspective, we do need to give children the chance to grow up with others from different backgrounds, especially where their communities are segregated and they have no experience of difference. We know that contact between groups improves tolerance and breaks down prejudice – and will even contribute to tackling extremism. But we appear to be going in the opposite direction. Tackling residential segregation is more difficult and will take longer to achieve, so schools are our best chance for integration; they should be the bridges between communities, not compounding the problem and slowly dismantling the bridges. Previous studies have also been revealing and we could have followed their methodologies, but they only compare pupils in each school with the ethnic and social class representation of the local area as a whole, and generally use out of date Census information. As we point out in our report, had we adopted the same approach we might have revealed even more segregation if it is simply understood as a majority of the school population being from an ethnic minority. For example, applying a threshold of 30% or less of the school population being White British, Birmingham has 132 primary schools and Bradford has 56. By contrast, Birmingham has 40 primary schools with a ‘low’ White British pupil representation and Bradford has 33, using our methodology. In other words, our methodology better reflects segregation in relation to the local area – and it is much more up to date. This is achieved by using the pupil population in 2016 from the neighbouring 10 schools, rather relying on the generalised Census information from 2011. It is unfortunate that ideas about ‘segregation’ have become part of an orthodoxy, often reliant on the use of out of date statistics and the Index of Dissimilarity. The IoD has its’ uses, but it also has its’ limitations. ‘In our case your basic 10-nearest-schools was difficult to interpret because of the non-interacting catchments of the different LAs, but when I probed deeper I came up with the interesting observation that the school within the northern half of the area had a higher FSM population than those in the south, even though the known deprived areas were in the southern catchment. ‘It is something that as a governor I will follow up. It may possibly be a hangover from the days our school was a grammar and the other a secondary modern even though the change was almost 50 years ago. These days the two school catchments pretty much serve as a joint catchment for all schools, with our school right on the boundary and equally accessible to both sides. Longer term though the population is rising, and we are moving towards all three schools joining up in a MAT which may initiate all sorts of discussions about the way the schools both work together and at the same time provide a level of choice to parents. Traditional patterns of school selection are often taken for granted in this way – even for more than 50 years! But with the impact of parental choice, become even more challenging. This is also true for some categories of schools, perhaps especially faith schools. Catholic and Church of England schools are by far the most numerous and their collective impact on school representation is clearly significant yet often unexamined. As an example, in one London Borough the 17 faith primary schools that have somewhat diverse intakes, take between one and five times the proportion of White British compared to the area, substantially reducing the potential for other schools to become more mixed. So, change is possible. and we now need to put a premium on mixed schools and develop a strategy to achieve that aim. This new report, written by Ted Cantle, with SchoolDash and The Challenge, reveals increasing school segregation is increasing and, more especially, that school segregation now exceeds the segregation in the local area. It suggests that we now need to put a premium on mixed schools and develop a strategy to achieve that aim. Professor Ted Cantle said: “Children need to grow up with others of different backgrounds especially where their communities are segregated and they have no experience of difference. We know that contact between groups improves tolerance and breaks down prejudice – and will even contribute to tackling extremism. But we appear to be going in the opposite direction. Tackling residential segregation is more difficult – people cannot simply be moved from one area to another. So schools are our best chance for integration; they can be the bridges between communities. But instead, schools appear to be compounding the problem and slowly dismantling the bridges. The Government launched a consultation (ends on the 12th December) which will reverse the policy espoused by David Cameron and will remove the obligation to offer 50% of places to other faith children in over-subscribed faith free schools. Is Segregation Increasing in the UK? Research published by leading integration experts Professor Ted Cantle and Professor Eric Kaufmann reveals that while England as a whole is more ethnically mixed, we are allowing white and ethnic minority populations to become more isolated from each other. The research, published on openDemocracy, presents census data in an entirely new way and comes as the government prepares to publish its major review into integration, segregation and extremism, led by Integration Tsar Dame Louise Casey. This also follows the national debate about immigration in the UK’s decision to leave the European Union and the surge in hate crime. Professor Cantle commented “the antipathy towards some communities may have been much less if we were more integrated and actually lived in mixed areas – all the evidence suggests that prejudice and intolerance is broken down by contact”. The research finds that while generally society is becoming more diverse, another trend is emerging – the strong shift towards the polarisation of White British and minority groups is mainly in our urban areas. Ethnic minorities in many towns and cities across England – from North to South – such as Slough, Birmingham, Leicester, Luton and Bradford, as well London Boroughs, are living in areas with an increasingly dwindling White British population and growing minorities. Ethnic minorities are increasing in many areas but this trend has not kept pace with the overall change and is further away from a proportionality. The trend towards isolation is even greater in smaller geographic areas, for example at ward level. The pace of change is striking, and most prominent in urban ‘pockets of diversity’, many showing a decrease in the white population of over 50 percentage points from 1991-2011. Professor Cantle, who carried out a report into community cohesion in the wake of a series of race riots in 2001, said: “Analysis of the census data on ethnicity has to date been very broad and has concealed some of the trends and findings this research unveils. Chuka Umunna MP, Chair of the All Party Parliamentary Group on Social Integration, said: “During a year in which our country has seemed more divided than at any point in modern history, there are few questions which require investigation more urgently than the matter of how well we are living together. Equally, however – at a time in which our political debate has become yet more polarised and media headlines yet more fraught – there are few questions which it can seem harder to get to the bottom of. 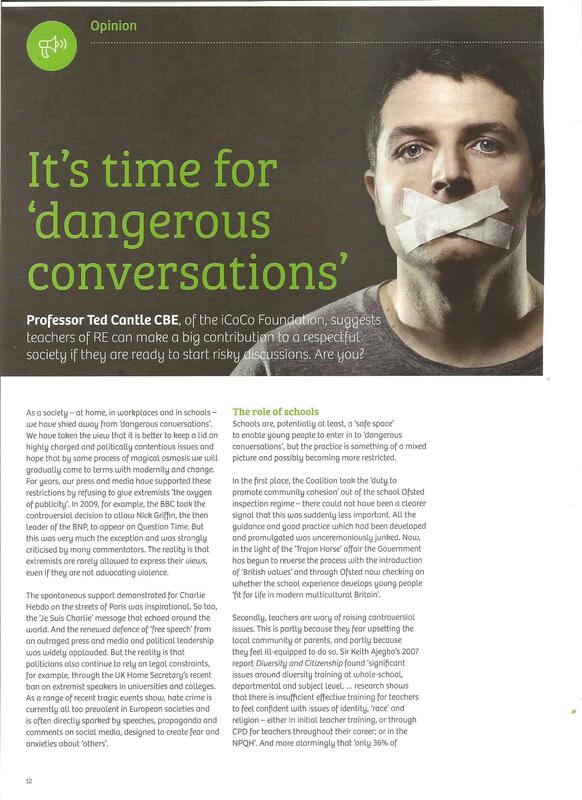 Ted Cantle argues that schools should be prepared to discuss contentious issues – It’s time for ‘dangerous conversations’ in which extremist views are debated. Instead of banning extremists, they should be robustly challenged and young people should be helped to acquire critical thinking skills so that they are more resilient to extremist ideology. And, in particular, schools should ensure that all students develop a fully fledged religious education – or ‘religious literacy’ – and state schools should not be allowed to just offer instruction in one faith, they should provide a critical analysis of all faiths and non-faith beliefs. 18th March at a special reception. It has been widely welcomed as a new way of addressing Far Right extremism and prejudice. ‘In the past, we have been content to just denounce these extreme views as ‘ignorant’ and ‘racist’’ said Professor Ted Cantle (ICoCo) and Professor Paul Thomas (University of Huddersfield), who have co-authored the report. ‘Now, for the first time, we know we can challenge extreme views through the direct engagement pioneered by EYST. All local areas need to learn from this success – and help young people counter the appeal of racist ideology and bigotry’. The warning signs for democracy are clear: the decline of mainstream political parties and voter turnout, growth of Far Right and Popular Extremist Parties, the lack of trust in politicians hit by scandals, and a political elite, locked into a Westminster ‘bubble’, seemingly detached from the everyday concerns of the people they represent. So, now that the party conferences are over it is time to ask ‘How do we reconnect the political class? My ideas are published by Open Democracy. Radical ideas include a limiting politicians’ terms of office; working on line from High Street offices rather than staying within the ‘Westminster Bubble’; removing Government/Opposition formalised positions in favour of a collaborative culture; a completely new system of appointments to the House of Lords and; developing systems of political plurality. Support for the idea of interculturalism is expanding and developing and is fast becoming an alternative progressive perspective to that of multiculturalism. In this new academic paper http://www.upf.edu/gritim/actualitat/workingpaper.html#.UhI-l5L0_is , Professor Ricard Zapata Barrero (Zapata-Barrero, 2013; Departament de Ciències Polítiques i Socials, Universitat Pompeu Fabra, www.upf.edu/gritim ) reviews Gerard Bouchard’s L’interculturalisme: un point de vue quebecois, and Ted Cantle’s Interculturalism: The New Era of Cohesion and Diversity. A range of other publications, including those setting out policy and practical frameworks, will be published shortly, reflecting the view that multiculturalism has been locked in to a series of single countries who only see diversity as an accommodation between their majority and minority populations rather than an unfolding pattern of diversity on a global scale. friendships and to become more tolerant and respectful of ‘others’ are completely lost. and ethnicity but have now been found to be excluding poorer pupils too! ….but as the Government has cut back community cohesion resources so much, will it be heeded? Matt Ridley’s contrarian views (Earth to Met Office: Check your climate facts, May 20th, 2013) have to be set against the weight of mainstream scientific evidence. Granted that no science can ever exclude the ‘possibility that climate change will be slow and harmless’, the risks of accepting Ridley’s hunches are so immense that we cannot afford to stop taking immediate action and insuring against irreversible longer term damage. Appealing though it is, we should not allow ourselves to take comfort from his ‘rational optimist’ ideology. We should also recognise that de-carbonising the economy has other benefits – the substantial health risks and environmental degradations resulting from the use of fossil fuels would be reduced as a result. Further, the UK would also be able to decrease its dependency on energy imports and improve energy security – again a very significant problem. These other drivers of change have recently gained credence in the United States. Meanwhile, this Government like the last has accepted carbon reduction targets. Achieving those will not be easy as the debate about wind farms shows. But we do need to show a real resolve to protect the planet for the benefit of future generations and Ridley’s highly selective use of data and his focus on the short term must be firmly rejected. The state remains a very powerful force in the lives of many people and is the most significant unit of democracy in the developed world. For many, being a citizen of a particular state, having absorbed the traditions and cultures, being subject to its laws and economic regulation and taking part in the polity, a sense of belonging is still very evident. But the role of the state has changed profoundly in recent years and it is under threat from above and below. The campaign for more mixed and inclusive schools is gathering pace. Faith schools in particular are being challenged – see for example the Richmond inclusive schools campaign (http://www.richmondinclusiveschools.org.uk/) which was set up in opposition to a new Catholic secondary school in the Borough. Ted is a Distinguished Supporter http://accordcoalition.org.uk/our-supporters/ of the Accord Coalition’ campaign – see 28th November story below. 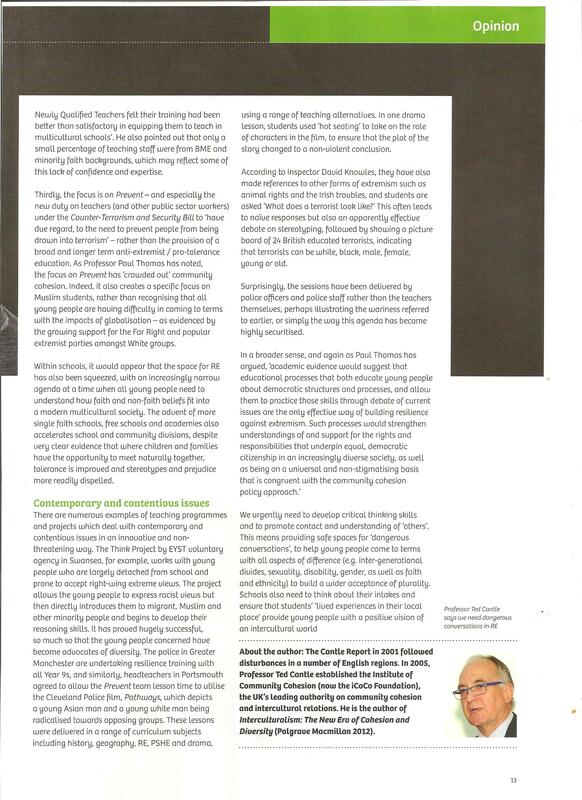 Political Insight Magazine publishes Ted Cantle’s critique of Nasar Meer and Tariq Modood’s earlier defence of multicultural policies. Ted sets out the arguments for interculturalism and contends that it now offers the only effective progressive framework for diversity in an increasingly globalised world. Faith organisations should adopt an ethical code of practice to govern the unacceptable way they deal with inter-faith relationships, says Ted Cantle. Speaking to the Faith and Civil Societies Unit in London, he says that faiths are creating impossible choices, particularly for parents of mixed faith children and in some instances their behaviour is oppressive and represents an assault on human rights’ For more details Click here.